It’s getting to be late fall and that means the list of the weekend’s best matchups is lean. I have just five for you this week, but they’re good. Take a look. The 31 teams that qualify to the NCAA Cross Country Championships are determined by a regional and at-large system. The top two in each of nine regional meets automatically qualify, and then another thirteen teams get at-large bids based on regular-season wins over qualified teams. Flotrack has worked out multiple scenarios for at-large qualifiers. In the big picture, who wins the various regional meets does not really matter. The best teams will attempt to get an automatic qualifier while using as little energy as possible, saving their big effort for next week’s national championships. This is a qualifying round, much akin to heats of the 5k. Qualifying is the goal, not winning. The real drama in qualifying rounds is at the cut line between advancing and being eliminated, and there will be an upset or two. Teams can get in on a “push”, in which they lack the qualifying points necessary to get into the nationals but finishes ahead of a team at their regional meet that does has enough. The lower-finishing team gets in and pushes in the higher team in too. Where could that happen? It requires a deep region, but not too deep. The Great Lakes region usually brings in a team on a push, and the Northeast and West look like possibilities too. But the really fun thing is that we won’t know until the dust settles on Friday. The Wisconsin Badgers owned one of the most impressive streaks in college cross country with fourteen straight men’s Big Ten Conference titles. That’s owned, past tense, because it came to an end two weeks ago with their third-place finish behind Indiana and Michigan. What Byrne did not mention was the other notable Wisconsin streak: eleven straight wins at the Great Lakes regional. These Badgers are athletes and competitors and I cannot imagine that they will be doing anything but going for the win–and they have the home advantage. In matchup #1 I said it didn’t matter who won these regional meets, but this one matters a lot. College cross country made it into the mainstream sports press this week but not for a good reason. BYU runner Jared Ward was initially ruled ineligible for this season by NCAA regulators because they chose to classify a 2009 pre-high school fun run as an “organized competition”. The NCAA got the usual round of Bronx cheers from the public after the news was broken earlier this week, an appeal was held on Thursday, and he was ruled immediately eligible. So he’s running in the regional meet (and presumably the NCAA Championships, should BYU qualify). Let’s lay aside the issue that BYU fought this battle for three years before the negative press righted this stupid wrong in less than a week. What does this mean for BYU’s cross country team? Ward is a stud runner. He was 14th at last fall’s NCAA Cross Country Championships and 8th in the 10k at June’s NCAA track championships, and was expected to be the team’s leading runner this fall. If we suppose he had been the team’s top runner at Wisconsin’s Adidas Invitational four weeks ago, then the Cougars would have narrowly beaten #2-ranked Northern Arizona for the team title. In other words, Ward could give BYU a realistic shot at the NCAA title. But is he ready to run like that? BYU head coach Ed Eyestone told the Deseret News that he and Ward “assumed it [his eligibility battle] was over and that it was time to move on”. 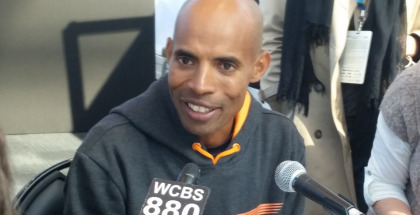 He trained for and ran the Chicago Marathon, finishing 19th (6th American) in 2:16:17. He clearly has fantastic base conditioning. But that marathon was a month ago. Ward has probably gotten back into good training but with little fast work and no fast races. He’s got one week to get into race shape to try and lead his team to an NCAA Championship. It’s a long shot–but boy, wouldn’t that be the greatest story of all time? “Team gets screwed by NCAA, wins NCAA title anyway”. The .US National Road Racing Championships is a new event and culminates USATF’s national circuit of road racing events. The USA Running Circuit is a series of ten races, with points handed out on a 15-12-10-7-6-5-4-3-2-1 basis. Points are tripled at this final race, which means that any of seven entrants could conceivably win the series title. In practicality, it’s going to come down to the three mentioned above. Tegenkamp leads the series with 60 points earned in five races (two wins, three thirds), followed by Biwott with 52 points and Boit with 50. If Teg or Biwott win they take the season championship; Biwott can win with a victory if Teg is third or lower. The twist is that all three of these runners are coming off of a fall marathon. Biwott and Boit ran the Twin Cities Marathon on October 6, while Tegenkamp ran the Chicago Marathon one week later. Whoever bounced back from their big effort will have an advantage. Were this race earlier in the year, it would rank much higher in my list of matchups. 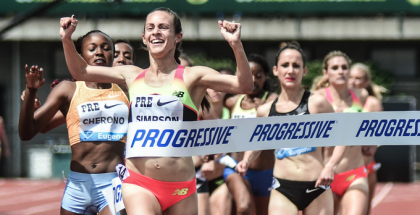 Huddle is the American Record holder at 5000 meters and Flanagan holds the AR over 10,000 meters; they are the two best long-distance runners in the USA right now. It’s not their peak season but this should still be a great race. There is a strong possibility of a spoiler, though. 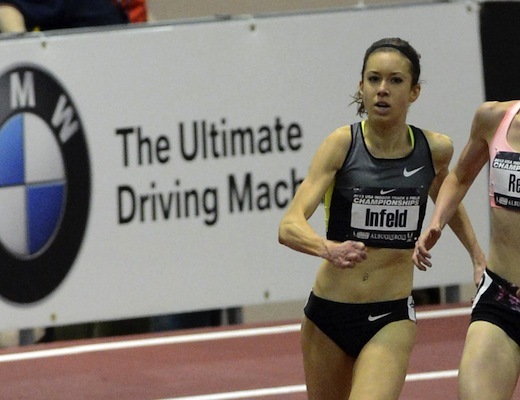 It’s Emily Infeld, the former Georgetown standout who has just finished her first season of professional running. She missed much of the summer racing season and has come on strong in the fall, with some great results in her first two “long” races (6 miles and 10k). But she’s never raced this far before. In terms of the overall series title, Mattie Suver leads with 47 points and Janet Bawcom is right behind with 45. But both are only two weeks past the New York City Marathon makes it unlikely that either will be able to hold on. The number of combinations and permutations of possible series winners is dizzying, so just sit back and watch the big guns battle it out.